"The next twenty-five years offer an opportunity to transform the way students have learned for centuries. We will be able to deliver education to students where they are, based on their specific needs, desires, and backgrounds." Imagine a university where programs are tailored to the needs of each student, the best professors are available to everyone, curriculum is relevant to the workplace -- and the value of the education is demonstrable. In Change.edu, Andrew S. Rosen shows how that future is possible but in danger of being stifled by a system of incentives that emphasize prestige and tradition, rather than access and outcomes. The U.S. higher education system has historically been considered one of the best in the world. This thought-provoking story presents the imperative for transforming that system for the 21st century and beyond. 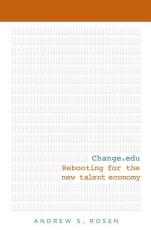 Rosen takes on the sacred cows of traditional higher education models, and calls on the country to demand the changes we need to build a qualified workforce and compete in a global economy. Change.edu is sure to open minds -- and open doors to a wealth of opportunities.